Who insisted on wearing a sheitel. Thus the New York Jewish Week, in the lede to its September 30 story last year on “A Portrait of Jewish Americans,” the Pew Research Center’s survey of Jews in America. The New York Times, in Laurie Goodstein’s October 1 story, took a crucially different tack: “The first major survey in more than ten years finds a significant rise in those who are not religious, marry outside the faith and are not raising their children Jewish—resulting is rapid assimilation that is sweeping through every branch of Judaism except the Orthodox.” Emphasizing intermarriage and assimilation, the Times threw down the gauntlet. What was the Pew story? Was it about kashrus and such—a decline in observance—or about actual loss of identity? • One in five Jews (22 percent, approximately the same as the percentage of “Nones” in the general public) describe themselves as having no religion. • Less than two percent of Americans identify their religion as “Jewish” as religion, a decline of half since the late 1950s. • Secularism appears to be regnant, as 62 percent say that being Jewish is a matter of ancestry and culture, while 15 percent say that it is a matter of religion. • Jews of no religion (“secular” Jews) are much less connected to Jewish organizations and are much less likely to raise their children Jewish, whereas 90 percent of Jews by religion raise their children Jewish. • Intermarriage—long the Jewish bugaboo and worse—is more common amongst secular Jews than amongst Jews by religion: Seventy percent of married Jews of no religion have a spouse who is not Jewish, compared with 36 percent among Jews by religion; and intermarriage appears to have risen substantially over the last half-century. • Altogether, Pew found there to be 6.3 million Jews in America; that was 15 percent higher than the 5.5 million of the highly respected 1990 National Jewish Population Survey (NJPS) but well below overall U.S. population growth of 25 percent. What Pew discerned was a dramatic generational shift away from Jewish identity rooted in religion and traditional institutions, to one that’s more secular, fluid, and, more broadly, American—implying a decline in Jewish identification itself. And compared to the Forward’s understated approach, the rest of the Jewish press was gloom and doom. The Jewish Telegraphic Agency (JTA), the century-old news service for Jewish communities worldwide, led the way. “People want to have the news when the sky is falling,” said JTA publisher Ami J. Eden. “We decided to go with the ‘Nones’—people who say that they have no religion—in the lede because that seemed like the most compelling, and most dramatic, in the study,” said New York Jewish Week managing editor Robert Goldblum. In Israel, the center-progressive newspaper Haaretz, always ready to bemoan the state of American Jewry, issued two Pew-based jeremiads back to back: “Reengaging American Jews Before They Drift Away” (October 8) and “Who is an Assimilated Jew?” (October 9). Indeed the gloom and doom within the Jewish community was widespread, and in synagogues and community centers across the country talks and conferences were held to discuss the Meaning of Pew. But for professional insiders, the findings on Jewish identity did not come as a surprise. As Forward publisher Samuel Norich cannily observed, “Pew was not only predictable, it was predicted.” As far as the professionals were concerned, the real news had to do with the religious movements. According to Pew, the largest movement continues to be Reform Judaism, with which 35 percent of American Jews identify. After that it’s 18 percent Conservative, 10 percent Orthodox, and 6 percent such smaller groups as Reconstructionism and Jewish Renewal. Relatively high fertility rates persist among the Orthodox, who also have a substantially lower dropout rate than the other movements, especially in the 18-to-29-year-old cohort (17 percent). The Pew data on the movements are highly suggestive of major changes within the movements. The Conservative movement, once regnant in American Judaism, is plagued with problems that may be insoluble. Forty-three percent of the Jewish population in 1990, it has declined more than one percentage point per year since then. 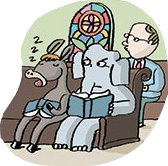 In some measure the movement’s demographic decline has been replaced by pockets of energy—independent synagogues and “congregations of renewal,” many of which come out of a Conservative base, which is the leader of a “post-denominational” trend. The problem is that the number of these energetic institutions is far outnumbered by those in decline. None of this would be terrible were it not for the age-old dilemma of the disparity between Conservative rabbis, who are religiously observant, and the people in the pews, who generally are not. This gap points up the movement’s ambiguous relationship to normative Jewish normative practice. Moreover, its central lay and rabbinic organizations—the United Synagogue of Conservative Judaism and the Rabbinical Assembly—have always been weak, and the Jewish Theological Seminary has lost its monopoly over the training of Conservative rabbis. The Conservative movement has always maintained a clear and strong boundary between Jew and non-Jew. Should it obscure that boundary—for example, by permitting intermarriage—it would erase a distinctiveness critical to the movement’s self-understanding. It is not too much to say that the Conservative movement may be breaking apart. The issue for the Orthodox does not have to do with numbers, which have remained stable for more than two decades. It concerns, rather, a striking shift from Modern Orthodox to Ultra-Orthodox—or, more accurately, Sectarian Orthodox. After World War II, the Modern Orthodox demonstrated to the rest of the Jewish world that Orthodoxy was not an accretion of unthinking, obscurantist practices but a living religious tradition with serious intellectual underpinnings. Beginning in the mid-1960s, however, they began looking over their right shoulders at the more sectarian world of Agudath Israel and the Brooklyn Yeshivas. They also began shifting right on a range of public policy issues, including church-state, civil rights, Israel, and reproductive choice. Meanwhile, the Sectarian Orthodox (Haredim, in Hebrew) have become, if anything, more sectarian—paying increasing attention to the minute details of practice and limiting their engagement with secular studies. In a radical departure from 50 years ago, few members of sectarian communities today study in mainstream colleges. These changes in both the Conservative and Orthodox communities indicate a shrinking “middle” in American Judaism. Indeed, in “The Shrinking Jewish Middle—And What to Do About It,” an unpublished paper written in January, sociologist Steven M. Cohen, among the canniest observers of American Jewish life, treated this as the most important of the Pew survey’s findings. Almost as interesting as the findings was the fact that the survey was the first not to be conducted by a Jewish organization. When Jewish organizations first began counting American Jews in the 1950s, they gauged identification largely according to degree of ritual observance. If you said you kept kosher and kindled Shabbat candles on Friday evenings, you scored high on Jewish identity. This ritual package correlated to the religious movements. Those who scored highest almost always identified as Orthodox; those who scored low tended to identify with Reform—the movement that, as central to its ideology, jettisoned much traditional observance. The 1990 National Jewish Population Survey (NJPS), sponsored by the Council of Jewish Federations, responded by offering questions in a number of areas and asking respondents to choose among four modes of Jewish identification: “national,” ethnic,” religious,” and “cultural.” Seventy percent chose “cultural.” Whatever that meant, it suggested that there were many gateways to being Jewish. A decade later, a new NJPS sought to improve upon the 1990 model. It didn’t succeed. The questionnaire was overloaded, intricate, and far too complex. There were now seven categories of Jewish identification, suggesting that the surveyors simply did not want to be put in a position of saying who was and who wasn’t a Jew. Internal debates were so contentious that the survey did not appear until 2002. A decade later, no agency in the Jewish community was willing to undertake an omnibus demographic study. It is fair to say that the inability of the American Jewish communal establishment to do so is itself evidence of the weakening of Jewish identification and the consequent weakening of the establishment organizations themselves. So how did Pew come to step into the breach? Analysts had long noted that it was time that American Jews looked at their own community in comparison with other groups, but were insecure about doing so. Additionally, an important part of the answer had to do with Jane Eisner, editor of the Forward, the independent weekly (with daily on-line coverage) that has come to be considered the American Jewish newspaper of record. Eisner, having spent much of her career at the Philadelphia Inquirer (including as editor of the editorial page), had good relations with the Pew Charitable Trusts (parent of the Washington-based Pew Research Center) and the Neubauer Family Foundation, both headquartered in Philadelphia. The latter, established by corporate CEO and Jewish philanthropist Joseph Neubauer, provided a significant measure of financial support for the Pew study, and Eisner helped bring the funder and the research organization together. The twin goals of the survey were, he said, to answer the question, “What does it mean to be Jewish in the U.S.A.?” and to offer comparability—that is, a comparison between Jews and other religious groups in America. But in contrast to the earlier surveys conducted by Jewish groups, the purpose was not to provide a communal-needs assessment. “We were not primarily interested in the needs of the community and on the uses of Jewish institutions,” Cooperman said. The Forward ran no fewer than a dozen news stories, editorials, op-eds, and features on Pew, emphasizing the implications of Pew for the religious movements (“Conservatives shrug off Evidence of Dramatic Decline,” October 1; “Can Orthodox Buck Movement Toward More Liberal Branches of Judaism?” October 2); and on the intermarriage question (“Jewish Woman is the New face of Intermarriage, Pew Study Data Reveal,” February 13.) Altogether, the Forward treated its Pew series as a large-scale story unfolding, with big conclusions. Goldberg compared Pew’s findings with the 2002 NJPS and discovered a huge increase in Jews answering “none” for religion. Pew’s total in 2013 was 22 percent. The records from 2002 turned up 7 percent. Conclusion: Jews were abandoning religion. The article, an extreme version of the Forward’s general soft-pedaling of the bad news, drew reactions ranging from the lurid and excoriating to the merely defensive. Indeed, it polarized much of the subsequent discussion of the survey. Pew’s own response was sharp. In an October 25 op-ed in the Forward, Cooperman and religion survey director Greg Smith accused Goldberg of comparing apples and oranges. The category of “Born Jews With No Religion” in the 1990 NJPS was “considerably broader than the Jews of No Religion in Pew,” they wrote. Jews might very well be abandoning their religion. The bottom line from Pew, in this author’s view, is that Jewish identification is indeed a troubled arena and that intermarriage rates are higher than many Jewish professionals had come to think. But is the sky falling? 1Yiddish word for the wig worn by sectarian Orthodox married Jewish women, who observe the stricture against display of loose hair. 3The organization that coordinated fund-raising, allocations, and social planning on behalf of social-service agencies in Jewish communities across America. It has since been renamed the Jewish Federations of North America.